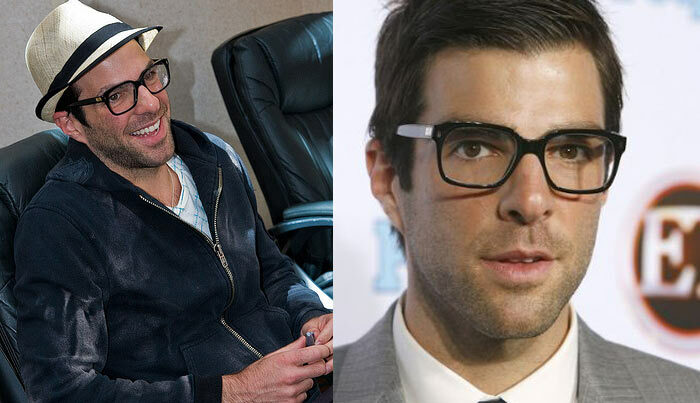 Actor Zachary Quinto can often be seen wearing some interesting styles of glasses when not acting as Sylar/Gabriel Grey in Heroes or as a young Spock in the J.J. Abrams summer blockbuster Star Trek due for release in 2009. » Plastic POLO Ralph Lauren prescription glasses. Zachary's character, Sylar/Gabriel Grey, is probably one of the most interesting characters of the hit NBC / BBC sci-fi series Heroes. Is he really evil or is he just misunderstood? Deep down, he doesn’t really want to be bad and he does have his moments, but he has killed a few people along the way. He really is the man we love to hate. Its easy to forget that the Sylar we know today is quite different to the watch repairman he used to be. Since Gabriel began to acquire other people’s ‘abilities’ through the use of his ‘intuitive aptitude’ (or to you and me, slicing off the top of one’s head to examine the brain and learn how it works!) he no longer wears glasses under his new assumed name ‘Sylar’. However, glimpses of the future version of Sylar show that he still needs his black-rimmed frames in everyday life.